This week’s Bella Petite Hour (with host Ann Lauren) and business expert Maria Gamb will focus on the importance of meeting the right connections and networking in effective ways to take your career to the next level. Whether you want to change your career, get that promotion you’ve been waiting for, or start a new business, we will tell you how to accomplish your goals. Networking is of the utmost importance when seeking a job or that perfect connection to get you to the next step. Spend less than an hour with me, Maria Gamb and our special guest Bryn Johnson and walk away with 5 Ways to Read the Room™ and Meet “Your People”. This will completely reenergize your networking efforts at events and other connection opportunities. You can’t afford not to listen!! You’ll gather ideas and action items to implement that very afternoon! · Do you spend hard-earned $$ on seminars with few results? · Are you trying to meet people to move your career or business forward? · Do pass out business cards with no real strategy? · Does networking exhaust you at these events? · Do you find a stack business cards collected from an event last year buried in your desk? “For 20 years in Corporate America, I ran teams and projects within human resources, consulting, management training, recruiting, client training and marketing through building relationships and encouraging innovation. Hundreds of young professionals were mentored and developed under my leadership of high-potential management training and internship programs. Tune in to the LIVE broadcast this Tuesday August 10th at 10:00 am PST on America’s Web Radio. If you miss the live show the podcast will be available here on Bella Petite and Itunes. If you have any questions please leave them here and we’ll be happy to discuss them with you! It is time you get a magazine you identify with. Subscribe today! We are ushering in a new breed of models and beauty. Our mission is to cover issues that are important to you! 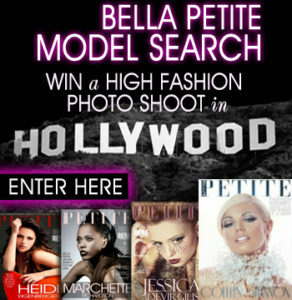 Enter the Bella Petite Magazine Cover Girl and Editorial model search. Sweepstake giveaways, prizes and great discounts to our registered members! Man.. Do I have the tools for networking NOW.. Thank you for bringing the insight together and opening my eyes and Petites in processing a more memorable presences with others via Networking in groups.. See.. This is applicable for us guys too.. Much appreciated!.. Maria Gamb.. you are simply amazing!.. Bryn Johnson’s education on communication skills.. are second to none. GREAT subject matter. Good one, Ann! Wow, I learned what to do to work that room! You girls were a blast to listen to this morning! Great education on the rules of how the networking game is done! Bravo gals! Is it bad to be controlling of the conversation or should I just make the conversation? I really worry about this one…help! I get nervous so I tend to keep talking.